Happy Friday, dear readers! I am back with another brand that showcased at Cosmoprof North America this summer! I actually discovered Make-Up Designory Cosmetics last summer while attending the event, but I couldn't resist a stop by the booth again to see their gorgeous products. 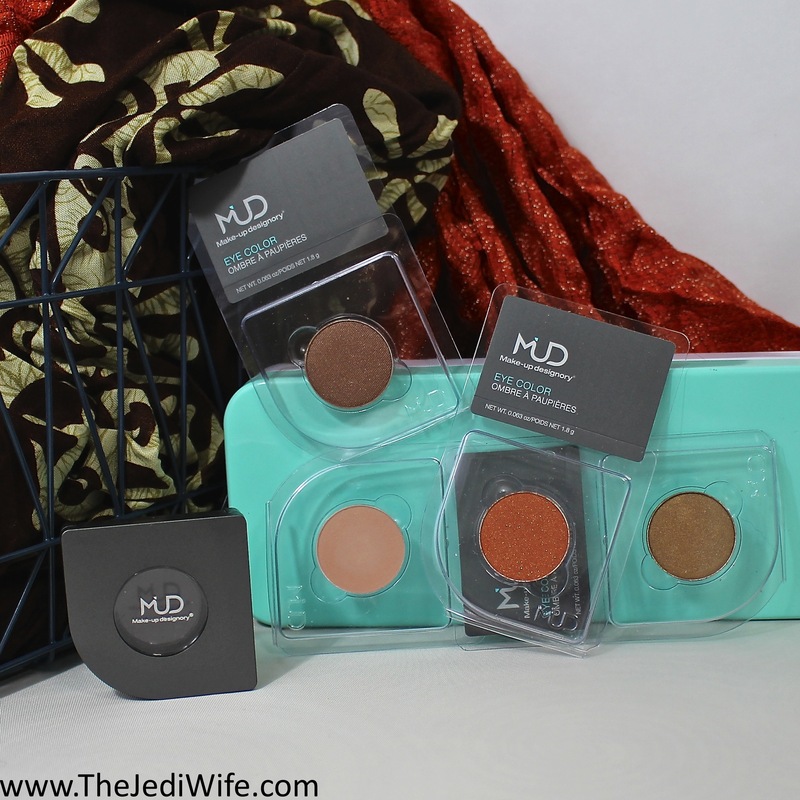 I am thrilled to be showcasing MUD Cosmetics on my blog again; let's jump in! I already had the single eyeshadow refill compact from MUD Cosmetics, shown above the eyeshadow pans, so I am going to focus on the four new-to-me eyeshadow refill shades for today's post. 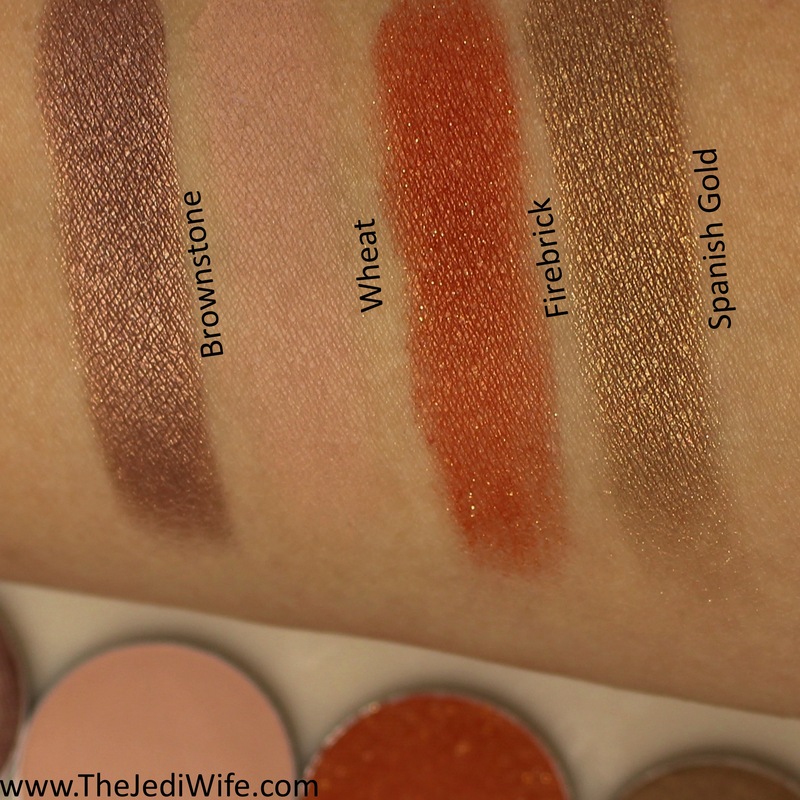 I received the shades Brownstone, Wheat, Firebrick, and Spanish Gold to review. Here are finger swatches of these eyeshadows on my arm. Brownstone and Spanish Gold are very pigmented right from the beginning while Wheat and Firebrick took a second pass to build up the colour on my arm. I also noticed Brownstone and Spanish Gold had a beautiful buttery soft texture, and while Wheat was slightly less so, it still felt comfortable to apply. Of all these shades, I was the most excited about Firebrick, and I was disappointed to discover the texture of this particular eyeshadow is very dry and chalky. I had anticipated some dryness due to the fine golden glitters in this eyeshadow, but I was shocked at just how dry this particular shade felt in the pan. 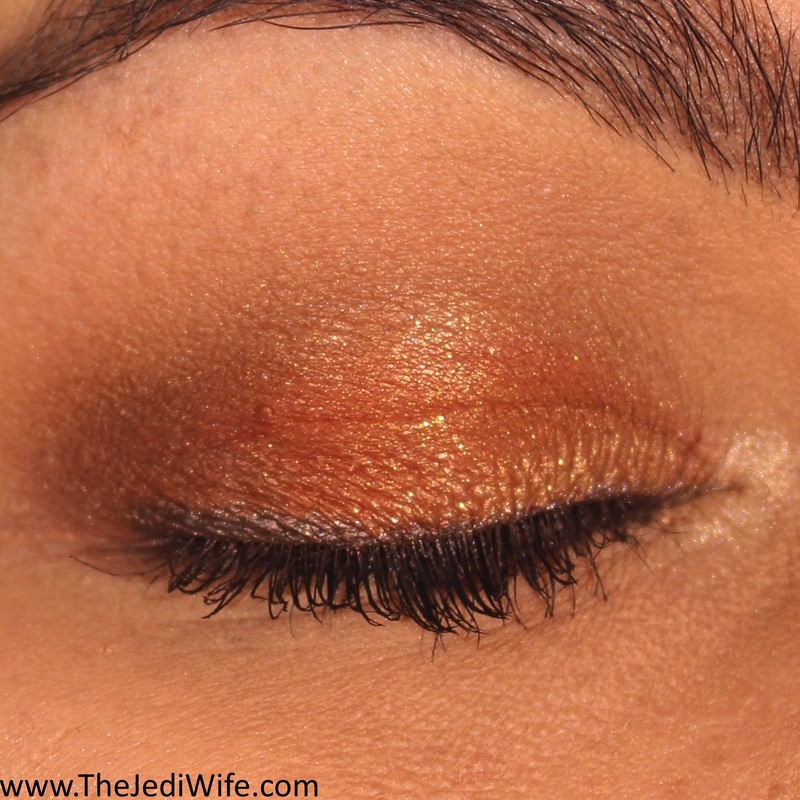 In spite of this shortcoming, I still wanted to use Firebrick and the remaining shades to create an eye look for today's post. Because Wheat wasn't quite the shade I was expecting (due to variations with computer screens), it ended up blending in quite a bit with my own natural colouring. It also was a little more of a peach than I wanted, so while I did use it for my eye look, I kept a much lighter hand with the particular shade. I created a subtle eye halo with Spanish Gold placed on the outer and inner areas of my eye and into the crease. I then placed Firebrick on the center of my eyelid with a damp brush; the damp brush was a necessity as the colour did not want to pick up well or transfer onto my eyelid with a dry one. I added a little more Spanish Gold to soften the transition between Firebrick and Spanish Gold along the inner area of my lid and added Brownstone to the outer lid to deepen the look. This ended up being my final look using these colours. I have very mixed feelings about my eye look using these eyeshadows. As a burnt orange fanatic, I lusted over Firebrick as soon as I set eyes on it this summer and could not wait to get it on my eyelids! The final result was sadly disappointing. I actually swatched Firebrick while at the show and didn't notice the dryness and chalkiness I experienced with the eyeshadow I was sent to review. I know the issues I had with my eye look can easily be attributed to the formula issues I had, and I really wanted a more intense orange look. Instead, the chalkiness really took over and I had to add more Spanish Gold to get a smooth and even look, lessening my intended KAPOW! While Firebrick was admittedly a huge disappointment for me, there is no denying that the formulas in Spanish Gold and Brownstone are phenomenal. Both these shades applied so beautifully for me and blended out so well. Because Wheat is pretty close to my own skintone and I used a light hand, I can't really comment too much about that specific colour. It felt comfortable to apply and seemed to blend out easily enough with the small amount I used in my eye look. 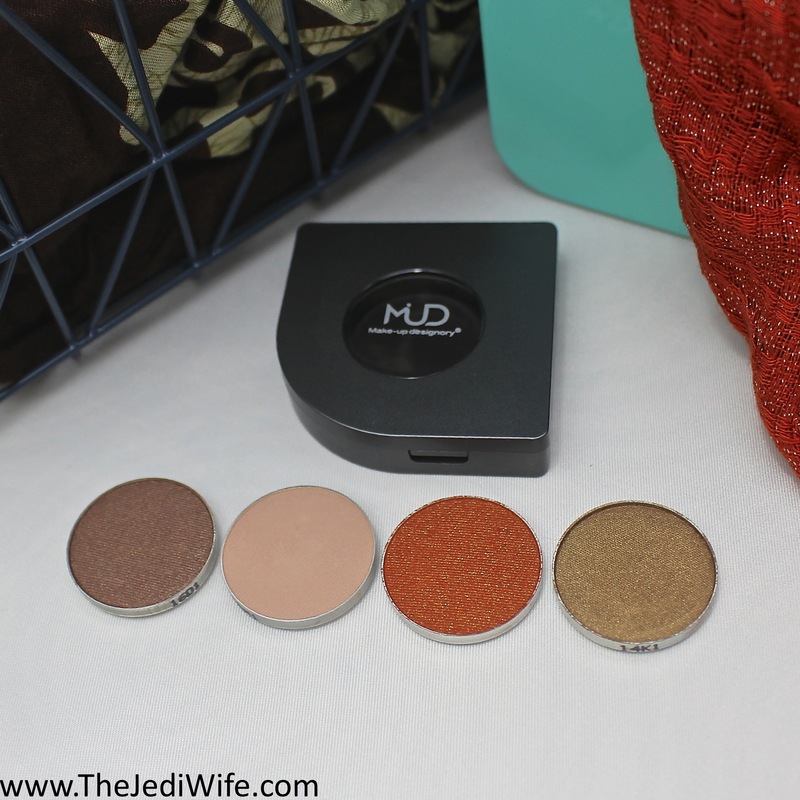 I have had a great experience with the MUD Cosmetics eyeshadows I have tested with the exception of Firebrick, so I'm going to chalk this up to a single shadow with a faulty formula. I enjoy the assortment of shades they offer and look forward to trying other products from the brand in the future! These eyeshadows and other cosmetic items can be purchased from the Make-Up Designory Cosmetics website located here. Have you tried any items from MUD Cosmetics? If so, what were your favorites? Do you like my eye look? I'd love to hear your opinions! Of course, the one I lusted over in your arm swatches is the one disappointment! I have so many neutral palettes that I really am on the lookout for great pops of color eyeshadows. What some beautiful shadows I think I love them all bar wheat which just seems something and nothing almost which is a shame. I have never heard of this brand, but these look awesome! I love how pigmented they are! I haven't heard of this band before and you seemed like you had a great time. You look so pretty in this! I'm a huge fan of those colors. Spanish Gold and Brownstone are the shades I buy over and over and I'd still buy them from MUD. I have some MUD shadows that I now need to find! Brownstone and Spanish Gold are stunning - the metallic in them is so pretty! <3 Bummer that Firebrick was a dud. too bad Firebrick was a bummer, it was my favorite shade! What a beautiful collection of eye shadows! My favorite is the Spanish Gold. These colors are so perfect for the fall season. I had not heard of the cosmetics from MUD. I do love your final look. So pretty on you! I didn't know MUD before. BUt the products sound really cool. The pigments of the eyeshadows look amazing! The shades are so classy. Thank you for sharing. Will surely check them out. I haven't tried any of their products but I am willing to test it. Love the shades! Even though your favorite color didn't have the best formula, these still suit your skintone amazingly well! Fantastic look. These eye shadow looks amazing. I would love to give these different colors a try. Thanks for sharing. I love the blend of colors. My favorite is the red. I need to grab some new fall colors. I don't recall hearing about this brand or maybe I have but just never tried it. I think they are definitely worth looking into and perfect for Fall.